Knee pain is a symptom of several different conditions and injuries, many of which are often characterized by knee pain getting worse at night. Understanding the cause of your pain is the first step to being able to treat it and get back to a good, uninterrupted night’s rest. This is a condition characterized by the loss of cartilage around a joint and is the most common cause of nocturnal knee pain. It accounts for approximately one third of cases. There is a soft tissue at the base of the patella known alternatively as “Hoffa’s fat pad” or the “infrapatellar fat pad.” In some cases, usually following a direct blow to the kneecap or a sudden twisting motion, the fat pad can become pinched (“impinged”) between the femoral condyle and the patella, resulting in pain. The knee houses three different ligaments—the anterior, lateral, and posterior cruciate ligaments. These provide joint stability while helping control excessive motion. If the knee joint becomes stuck while attempting to widen itself, like from a football tackle or other sources of excessive pressure, the ligament will get injured. This will result in aching knee at night, along with swelling. Also known as “patellar tendinopathy,” this condition is most commonly found, as the name would suggest, in athletes who play sports involving a lot of jumping. Those with this condition suffer from an injured patella tendon. The pain is usually focused on the front of the knees or below the patella, worsening when you jump. This is a rare, but thankfully benign, type of bone tumor that is usually located in the femur. Osteoid osteoma is more likely to occur in men, along with anyone between 5 and 25 years old. Why Knee Pains at Night? Trying to relax and go to sleep makes your brain more aware of things that can disrupt your efforts or put you in danger. Being alone and more isolated at night can also make pain feel worse. The body’s blood vessels increase in diameter while you sleep. This puts pressure on many nerves in the body and narrows available joint spacing. Many hormone signals are reduced during sleep. This could allow the brain to more easily receive pain signals. Many people with knee or hip pain report increased night pain following daytime activities. The triggering activities can be variable. Some patients report increased pain following everyday things like walking or standing while others only report an increase when they run, jump, or lift heavy objects. This is more common in those with osteoarthritis: low pressure weather, typically weather that is cold, damp, and windy, can exacerbate knee pain. The good news is that regardless of what causes your knee pain or why it worsens at night, many treatments for it will work regardless of origin. 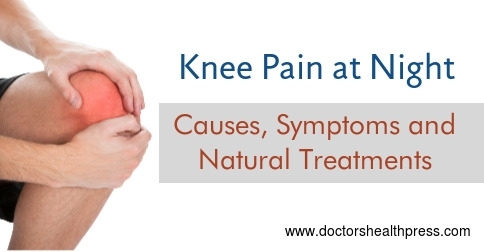 Pain medication is the most common method to treat aching knee. If you are already on pain medication and find it ineffective, consider switching to a type with a slow-release or “12 hour” dose. This should ensure the medicine’s continued effectiveness during the nighttime hours. However, it’s not advisable to stop or switch medication without consulting your doctor. Some patients with osteoarthritis reported their pain was eased by sleeping with a pillow pressed between their legs. However, those who frequently shift in their sleep are less likely to receive benefit from this method. This is a first-aid treatment protocol that aims to reduce swelling and pain responses, promoting blood flow through the limb. It’s important to remember not to apply ice for more than 20 minutes at a time and never to apply it directly to the skin. Ensure that the compression bandage is snug, but loose enough to avoid restricting blood flow. The warmth from a hot water bottle has also been known to assist in soothing sore knees. This is more likely to be successful if the source of the pain is injury-related. Sleeping with your legs straight puts a minimal amount of strain on the joints. As with most medical conditions, prevention is better than cure. Making sure that knee injuries are treated quickly and effectively minimizes the chance of developing long-term damage. Stopping activities that make your knee hurt, regardless of how urgent they feel, is additionally important. Regardless of cause of knee pain at night, minimizing stress to the knee and doing physical therapy exercises to strengthen the joint can also prove fruitful. Just remember to know your limits and listen to your body when it tells you to stop.